The positive side effect of the upgrade process, the entire JoomlArt team got a high learning curve and knows Joomla 2.5 in and out. Fixing bugs, putting hands on is the best way to learn a product, as web designers and developers. Do you agree? Joomla 2.5 is a big milestone for the Joomla & OpenSource community. With its core change separating the CMS and the platform will help us and other developers to have less Joomla update hassle (hopefully) in the future. Get the latest release notes on our Joomla 2.5 update pages Joomla 2.5 template batch release 1 (more will follow). Beginning of February we released the version 1.6.1 and close behind 1.6.2 (now version 2.5.0) in order to be full compatible with Joomla 2.5. As Joomla! release version changed to 2.5 (Long Term Release) we decided to change the version number of our T3 framework to 2.5.0 (read the change log), too. This way we are able to communicate clearly the big update of T3 framework along with our Joomla 2.5.x update effort. After all the hard work we decided to offer our existing members and dear reader 25% on ALL our membership subscriptions JATC, JAEC, JADev (except copyright removal). 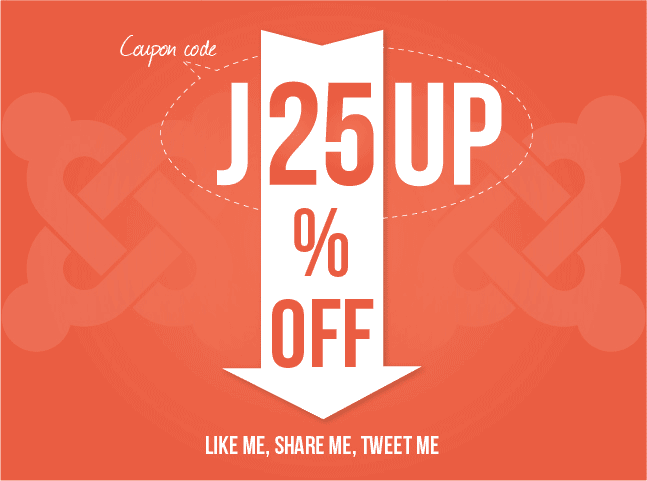 The coupon code is valid until the 25.02.2012. Where to add coupon code?